The stock market reaction to the Banking Regulation (Amendment) Ordinance, 2017 has been positive for banks and their high quality borrowers but negative for distressed firms, suggestive of its potential to rejuvenate banking sector health and to improve capital allocation across firms. The Banking Regulation (Amendment) Ordinance, 2017 was promulgated on May 4th, 2017. This Ordinance empowered the Reserve Bank of India (RBI) to direct banking companies to initiate insolvency proceedings in respect of a default under the provisions of the Insolvency and Bankruptcy Code, 2016 (IBC). It also enabled the RBI to constitute committee/s to advise banking companies on resolution of stressed assets. The RBI released a detailed action plan on May 22nd, 2017 to implement the ordinance. An Internal Advisory Committee (IAC) constituted by the RBI held its first meeting on June 12th, 2017. The IAC recommended that all accounts with an outstanding amount greater than ₹ 5,000 crore, and with more than 60% classified as non-performing by banks (as on March 31st, 2016) would qualify for reference under the Insolvency and Bankruptcy Code (IBC)1. Using these criteria, 12 accounts aggregating around 25% of the current gross Non Performing Assets (NPAs) were identified and banks were directed to file for insolvency proceedings under IBC in respect of these accounts. This study answers two questions: (i) How the capital market perceived the passage of the Ordinance empowering the RBI, and (ii) How the stakeholders reacted to the news of identification of default accounts. The Ordinance was promulgated post the trading hours on May 4th, 2017. Thus, for the purpose of the event study analysis, we take May 5th, 2017 as the event date. The event window around which the market response is analysed starts nine trading days before the event date and ends nine trading days post the event date. One week prior to approval of the Ordinance, while speaking at the Council for Foreign Relations on April 24th, 2017, the Finance Minister Shri Arun Jaitley hinted at empowering the central bank to address the problem of NPAs in the Indian banking system2. Since it was likely that the stock market might have reacted to this announcement prior to the actual event date, the empirical analysis captures a possible early response of the market, seven trading days prior to the event. The cumulative abnormal returns (CAR) are computed by cumulating the abnormal returns across time during the event window. The analysis focuses on the 36 scheduled commercial banks for which stock market data is available. Those banks that have a non-performing assets to advances ratio (NPAR) above the sample median value for NPAR for all banks in FY 2016 are classified as stressed banks. The remaining are classified as non-stressed banks3. The firm sample is divided into three sets on the basis of interest coverage ratio (ICR) in FY 2016: (i) low quality (ICR < 1) – 671 firms, (ii) intermediate quality (1 < ICR < 2) – 513 firms, and (iii) high quality (ICR > 2) – 1,432 firms. The event study analysis for all firms and associated banks is structured as follows: (i) comparison of stressed banks and non-stressed banks; (ii) comparison of low quality, intermediate quality, and high quality firms; and, (iii) comparison of low and high quality firms, segregated on whether their lead banks are stressed or non-stressed banks4. The second event study uses June 12th, 2017, the date of the IAC's first meeting as the second event date. It examines stock price reactions of the 12 defaulter firms that were referred to NCLT for resolution, and the lead banks of these firms. To study the relative market perception of these firms, all exchange listed firms in the same industry as the defaulter firms are used as control firms5. For the bank analysis, the 36 banks in the sample are divided into those that are the lead banks of any of these 12 defaulter firms and the remaining banks. Cumulative abnormal returns of stressed banks increased sharply following the Finance Minister's announcement (dashed red line at -7 in Figure 1, Panel A). This pattern continues till the event date, which is the date of promulgation of the Ordinance. In contrast, non-stressed banks witnessed a more modest increase in abnormal returns. Strikingly, abnormal returns between stressed and non-stressed banks widened to almost 5% between the time of Finance Minister’s announcement and promulgation of the Ordinance, indicating that markets perceived the Ordinance would help the stressed banks in resolving their NPA problem. Panel B shows that low and intermediate quality firms performed worse than high quality firms. Overall, these results indicate that the promulgation of Ordinance amending the existing Banking Regulation Act has been perceived by the market as being positive for stressed banks, but negative for low and intermediate quality firms. In Figure 1, Panel C and Panel D further explore which firms are driving these results, based on whether the firm's lead bank is classified as stressed or non-stressed. Thus, the analysis focuses on the linkage between banks and firms lying in the extreme segments of the performance spectrum (i.e. low and high quality firms). Panel C and Panel D examine the market reaction on low and high quality firms, separating firms that are related to stressed banks vis-a-vis non-stressed banks. Low quality firms linked to stressed banks performed worse than low quality firms linked to non-stressed banks. 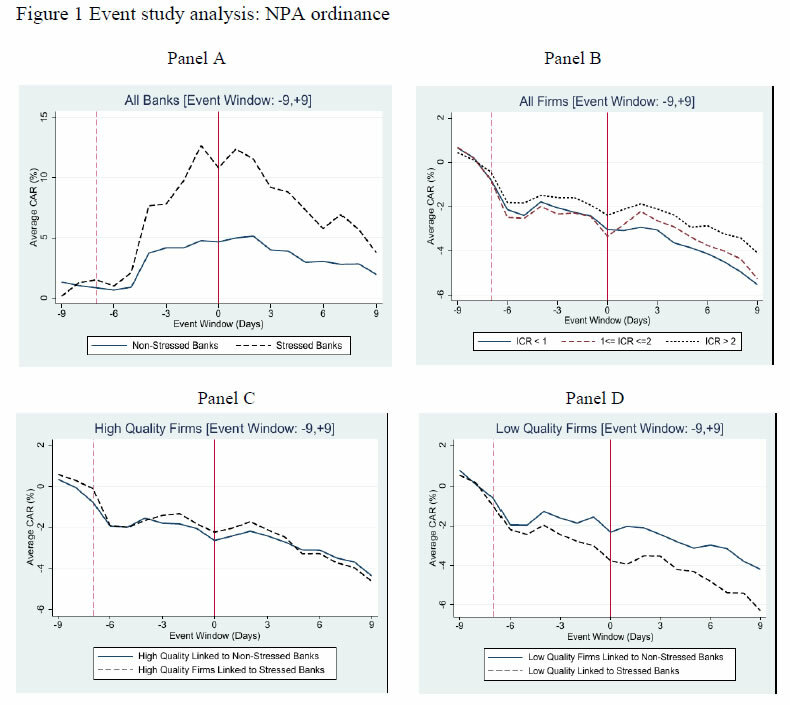 In contrast, high quality firms linked to stressed banks performed better than high quality firms linked to non-stressed banks, at least in the days immediately following the event date. It appears, therefore, that the market lost confidence in low quality firms linked to stressed banks but high quality firms linked to stressed banks are seen in a positive light. One possible explanation for this is that high quality firms linked to stressed banks benefit from a balance sheet clean-up of stressed banks. The market may also be reflecting long term benefits to high quality firms, possibly through the reallocation of resources away from low quality firms6. Panel A shows that defaulter firms registered a decline in abnormal stock returns compared to the other firms belonging to the same industry as the defaulter firm. The identification of these firms by the RBI was a clear indication of their poor financial health and it is evident that market lost confidence in these firms during the span of the event window. Panel B displays how the market responded to the lead banks of defaulter firms vis-à-vis other banks. In general, the abnormal returns increased for both the sets of banks immediately after the event, possibly reflecting that the market perceived that the Ordinance will help clean up NPAs from banks’ balance sheets. To summarize, the event studies point to a positive market reaction for banks but a negative market reaction for distressed firms. In other words, the Ordinance appears to have been good news for stressed banks as well as high quality borrowers, suggesting that as it has the potential to improve capital allocation in the Indian economy with significant positive spillover effects for healthy firms and to rejuvenate the banking sector. * The views and opinions expressed in MSM series are those of the authors and do not necessarily represent the views of the RBI. 1 Under the IBC, a case is admitted to the National Company Law Tribunal (NCLT), thereafter creditors have a maximum of 270 days to agree on a restructuring plan for the debtor, failing which the NCLT can order liquidation of the debtor. 3 Bank-level data is obtained from the Database on Indian Economy (DBIE), RBI. 4 The classification of lead banks is based on data from CMIE Prowess Dx. CMIE ProwessDx classifies banks based on their appearance in the firms’ annual reports. The assumption is that firms report the names of the banks they borrow from in order of importance. In the set of 2,616 firms analysed, the bank data is available for 2,357 firms of which 555 firms borrow from only one bank, and the remaining firms borrowed from two or more banks. For the remaining firms, we validate the assumption of lead bank classification by checking whether the chosen bank has been retained as the lead bank for last 6 years. In the set of 1,806 firms with more than two banks, 1,275 firm have retained the same bank as the lead bank for last six years. 5 All firms with insufficient stock trading data are excluded from the control sample. 6 Hsieh and Peter J. (2009) in their seminal paper find that misallocation of resources across firms can lower aggregate efficiency, particularly for developing countries such as China and India. One reason for this might be that underdeveloped and politicised institutions create technological sclerosis and result in spurious reallocation of factors of production such as capital and labor (Caballero and Hammour (1998) and Caballero and Hammour (2001)). Banks may be encumbered by a poor institutional setting which might make it difficult for them to pursue delinquent borrowers. The Banking Regulation (Amendment) Ordinance is a way to correct for this inefficiency. Indeed, based on Indian data, Kulkarni (2017) finds that an improvement in bank's ability to seize collateral reallocates capital and labor away from unhealthy firms. (2017a). “RBI identifies Accounts for Reference by Banks under the Insolvency and Bankruptcy Code (IBC)." Press Release. (2017b). “Reserve Bank of India Outlines the action plan to implement the Banking Regulation (Amendment) Ordinance.” Press Release. Caballero R., Hammour M. (1998). “The macroeconomics of specificity.” Journal of Political Economy, 106(4), 724-767. Caballero R., Hammour M. (2001). “Creative destruction and development: Institutions, crises, and restructuring.” World Bank Publications, Annual World Bank Conference on Development Economics. Hsieh C., Klenow P, (2009). “Misallocation and manufacturing TFP in China and India.” The Quarterly Journal of Economics, 1124(4), 1403-1448. Kulkarni N (2017). “Creditor rights and allocative distortions: Evidence from India.” CAFRAL Working Paper.